Part 1 introduces the farm, lays out the background information, gives specifics on tunnel dimensions, lists all materials needed and includes construction instructions from site preparation to ground post installation. Part 2 continues outlining the construction process. Includes information on bending, installing and anchoring hoops. 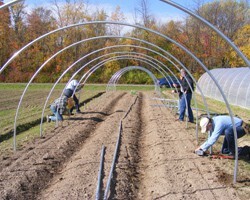 Part 3 concludes the construction process, covering ridge-pole installation, plastic attachment, end wall construction and photos of finished tunnels. It also contains links to additional resources.